I am new to logic. 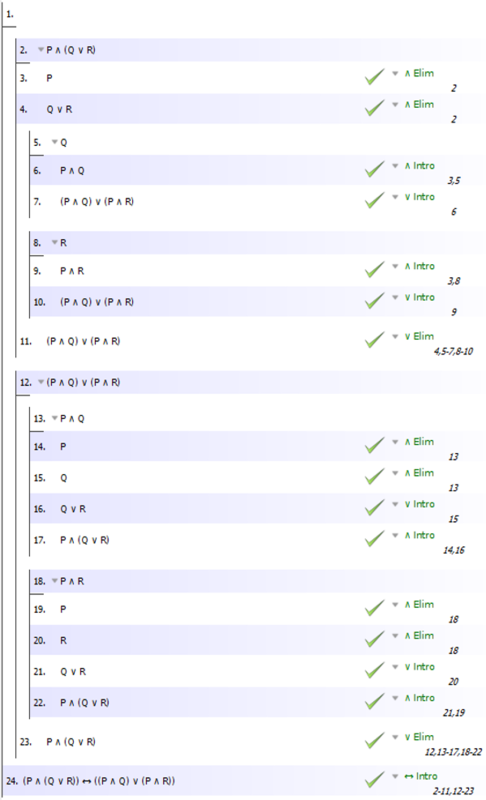 and here are my tryouts for deriving deriving "(p.q) v (p.r) from "p.(q v r)", and further I want to show that ”p. (q V r)” is equivalent to ”(p.q) V (p.r)”, by using natural deduction. I need two "p" for the conclusion, how can I introduce another "p" and keep it in the conclusion? First, we have to unpack the premise p ∧ (q ∨ r) using conjunction elimination to get the two conjuncts: p and (q ∨ r). 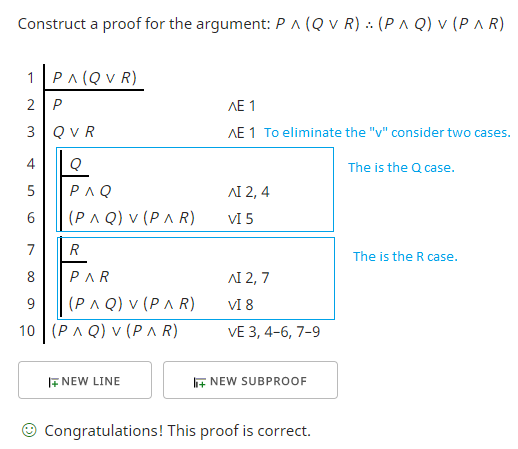 Then, we have to use proof by cases (i.e. disjunction elimination) to derive p ∧ q by conjunction introduction followed by (p ∧ q) ∨ (p ∧ r) by disjunction introduction, in the first case, and p ∧ r by conjunction introduction followed by (p ∧ q) ∨ (p ∧ r) by disjunction introduction, in the second case. (p ∧ q) ∨ (p ∧ r) is a logical consequence of p ∧ (q ∨ r). The Fitch-style natural deduction proof checker and editor I am using for this answer is associated with the book forall x: Calgary Remix. To get past line 3, we need to eliminate the disjunction, the ∨ symbol. This is an "or" statement. Either Q is true or R is true. So to eliminate the "or" we need to consider two cases. I drew thin blue boxes around the two cases, one for Q and one for R.
Regarding the question about needing two "p" for the conclusion, the extra "p" is added in lines 6 for the Q case and in line 9 for the R case. Note how this was done in the Q case. In line 4 I started a sub-proof by assuming Q. I need no justification for that assumption. In line 5 I used the fact that in line 2 I already have P and in line 4 I have Q as an assumption. Since I have both of them I can introduce a conjunction, that is, an "and" statement. Now I have P ∧ Q, part of the conclusion I want. After that I can introduce a disjunction, that is, an "or" statement to the P ∧ Q. What will I add? I can add anything I want. I already know this statement is true because one of the cases, P ∧ Q, is true. So I introduce the ∨ with precisely what I need to get the result I want: P ∧ R.
I've taken care of the two cases by constructing a sub-proof for each one and in each case I reached the desired conclusion. The proof will be complete once I claim that. In line 10 I state the conclusion from both sub-proofs. The justification of this is an elimination of the disjunction I started with in line 3 using sub-proofs in lines 4-6 and 7-9. The proof checker confirms the solution. We can go in the other direction as well. Bram28 does this in lines 12-23 of that proof. The last line of that proof introduces a biconditional by referencing as justification for the introduction the two sub-proofs on lines 2-11 and 12-23.